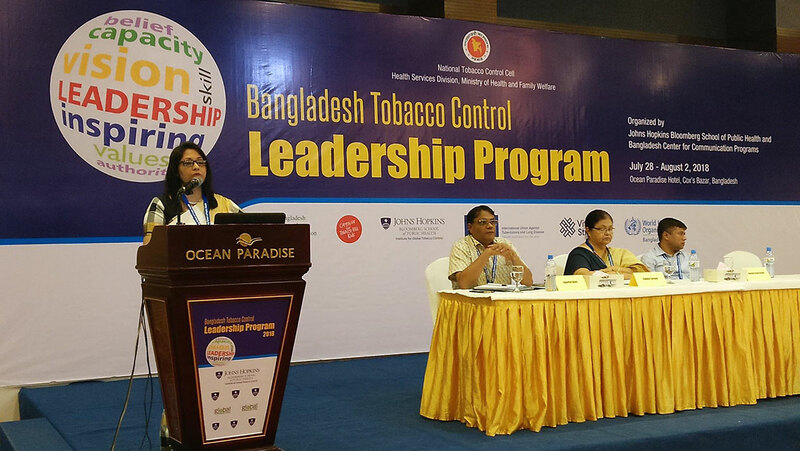 Johns Hopkins Bloomberg School of Public Health and Bangladesh Center for Communication program jointly organized the Bangladesh Tobacco control leadership program from 28th July to 2nd August at Ocean Paradise Hotel, Cox’s Bazar. Around 80 participants from anti tobacco organizations, government officials, media representatives and anti tobacco activists across the country participated in the program. The aim of the leadership program is to develop and enhance leadership in countries experiencing the greatest burden of disease and death from tobacco use by building capacity to develop, implement and enforce effective tobacco control policy interventions. The Program delivered by a faculty comprised of national and international faculty with expertise in tobacco control leadership, policy development and implementation, tobacco control economics, networking, communications, research, advocacy and surveillance. Ms. Nasim Banu, Deputy Director (Social Development) and team leader of Tobacco control project was present as a panelist in a session on “Advancing Smoke-Free Policy – Enforcement Mechanisms and Experiences from the National and Sub-National Perspectives” and presented YPSA’s tobacco control experiences in working with the Local Government on 30th July. Mr. Md Harun, Program Officer of Tobacco control project also attended as a participant in the program.